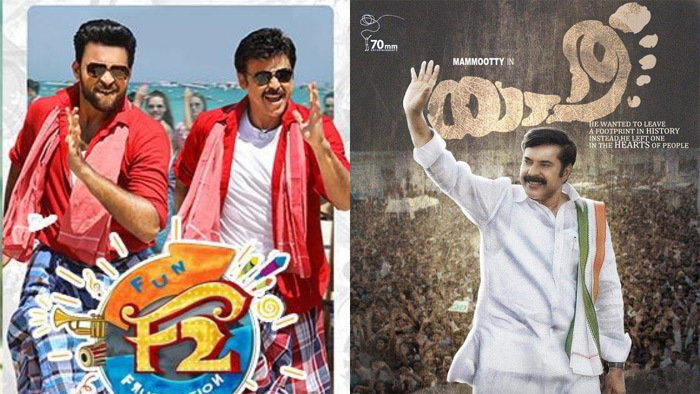 Malayalam super star Mammootty starrer Yatra, biopic on YS Rajasekhar Reddy, has opened to decent collections in its first weekend run. However, as per trade reports, the film witnessed drop on Monday. For first two shows on Monday in main theater Sandhya 70MM, the Mahi V Raghava directed film collected 11,279 and 20,439 respectively. Victory Venkatesh and mega prince Varun Tej starrer F2 Fun & Frustration that released during Sankranthi is still leaking good numbers at box office. In fact, the film is dominating even new releases like Yatra. For first two shows on Monday in main theater Sudarshan, the Anil Ravipudi directed film collected 14,112 and 27,346 respectively. Even though the film is available in Amazon Prime Video, audience still preferring to watch F2. Young hero Akkineni Akhil’s third film Mr Majnu is ending as another disaster for the actor. The film directed by Venky Atluri has collected nearly 17 K for two shows from its main theater- Devi 70 MM.